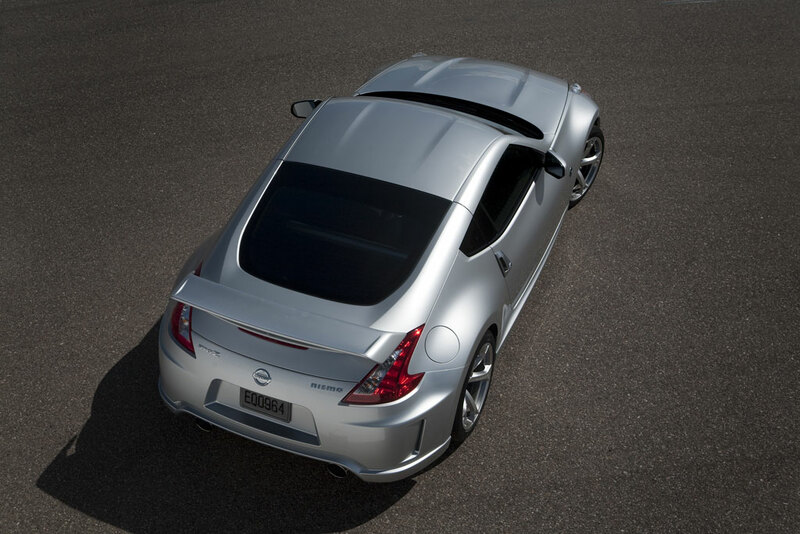 The all-new, second generation NISMO 370Z, which is set to go on sale at Nissan retailers nationwide in June 2009, continues the tradition of the original by offering unique performance and design attributes that true sports car enthusiasts are looking for – straight from the factory. 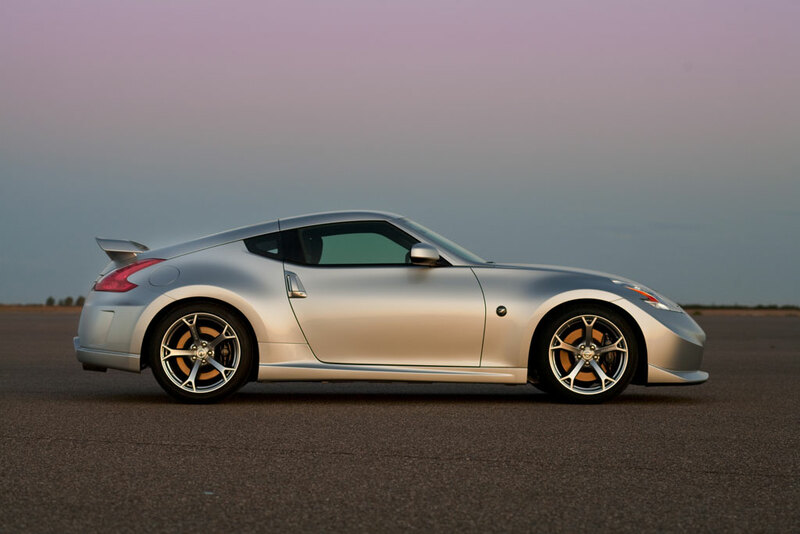 Like the limited production NISMO 350Z introduced two years earlier, the new NISMO 370Z is a tuner-Z® enthusiast’s dream, featuring a 350-horsepower 3.7-liter V6, racing-inspired exterior and interior styling, a specially tuned suspension and special super-lightweight 19-inch forged alloy wheels. 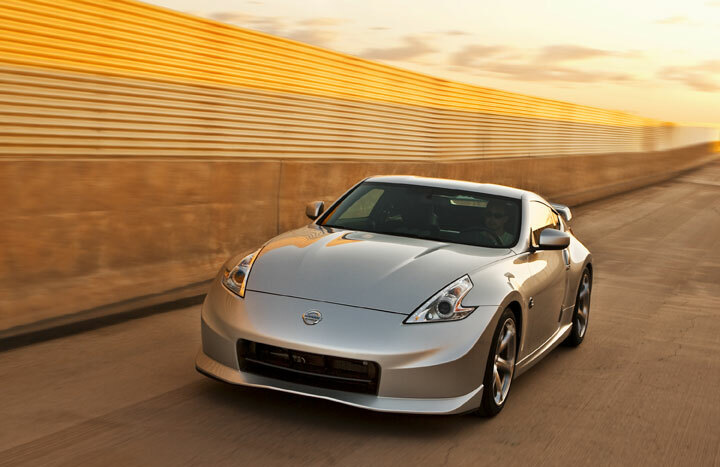 The 2009 NISMO 370Z was developed by NNA’s Specialty Vehicles Group in conjunction with Autech Japan, Nissan’s longstanding conversion partner. through use of an exclusive H-configured exhaust system design and muffler tuning, along with optimized ECM (Engine Computer Module) control. The NISMO 370Z is offered only with a close-ratio 6-speed manual transmission with Nissan’s new “SynchroRev Match” function, the world’s first synchronized downshift rev matching manual transmission system. The “SynchroRev Match” function automatically controls and adjusts engine speed when shifting to the speed of the next gear position, essentially “blipping” the throttle to smooth out any up/down shifts. This not only allows the driver to focus more on braking and steering, it improves vehicle balance and smoothness by reducing the typical “shock” when the clutch is engaged. The system can be deactivated with a button next to the shifter for drivers who prefer less vehicle intervention. 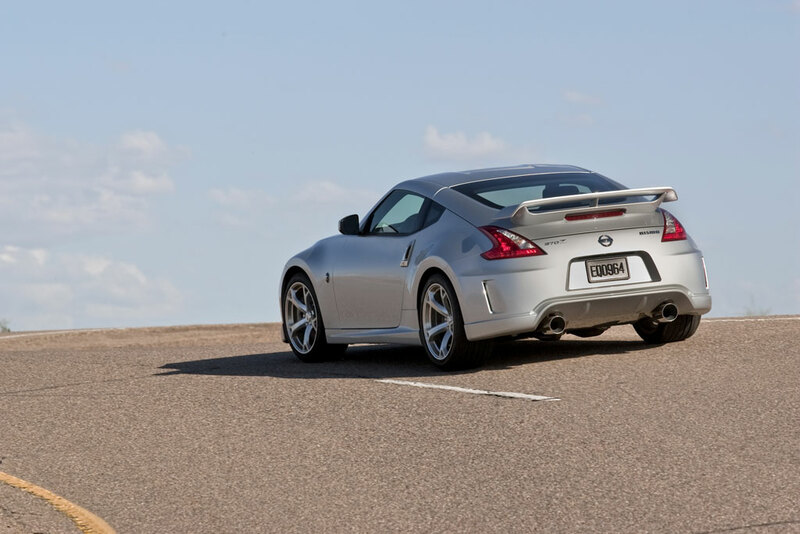 The NISMO 370Z features a tight, rigid body structure with a strut tower bar brace and a pair of performance dampers, which quickly and efficiently react to and control body vibrations from road input via the tires, contributing to the NISMO 370Z’s outstanding stability and performance feel. The NISMO Z®’s double-wishbone front/4-link rear suspension design suspension is specially tuned for exceptional stability and handling. 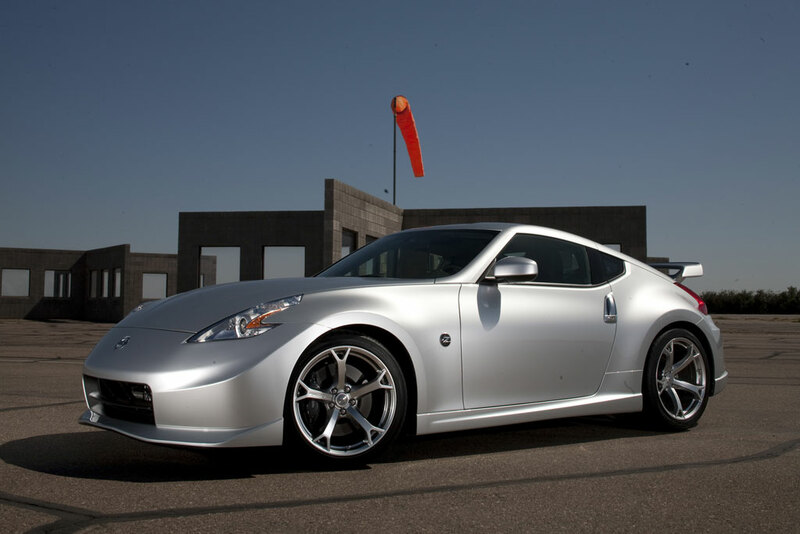 Compared to a standard Nissan 370Z Coupe, front spring rates have been dialed up 15%, rear spring rates 10%, front stabilizer bar rate upped 15% and the rear stabilizer bar is 50% stiffer. The roll stiffness rate has been increased by 15% and front and rear damping factors have been increased by 40% and 140% respectively. braking system also includes a variable ratio brake pedal for a more direct pedal stroke feel, Anti-Lock Braking System (ABS), Electronic Brake force Distribution (EBD) and Brake Assist (BA). 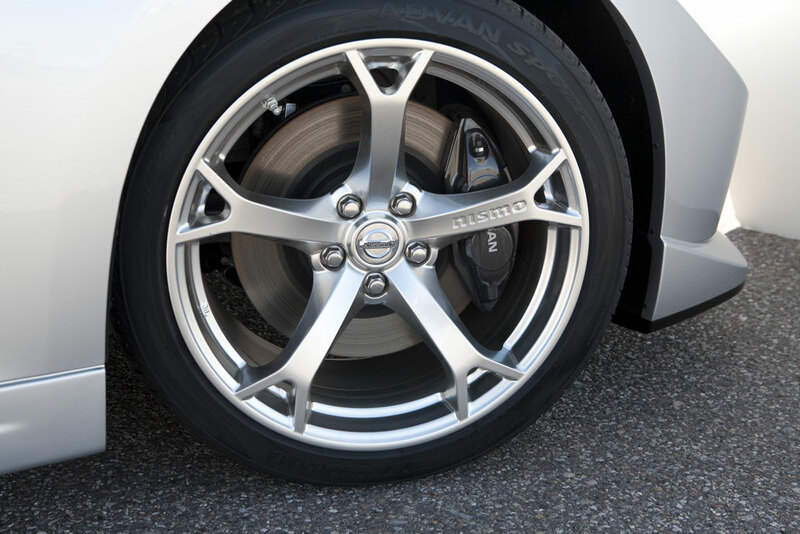 A Viscous Limited-Slip Differential (VLSD) is standard on all NISMO 370Zs, along with Vehicle Dynamic Control (VDC). 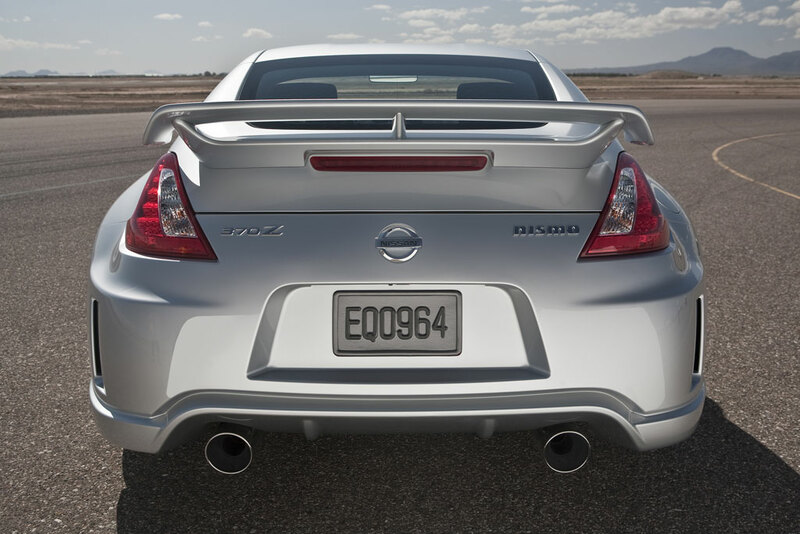 Along with its standout performance, the new NISMO Z® offers a standout appearance inside and out. The functional and fully integrated aerodynamic body pieces include an extended front nose design with a canard design at each corner for improved downforce and a fully integrated chin spoiler. 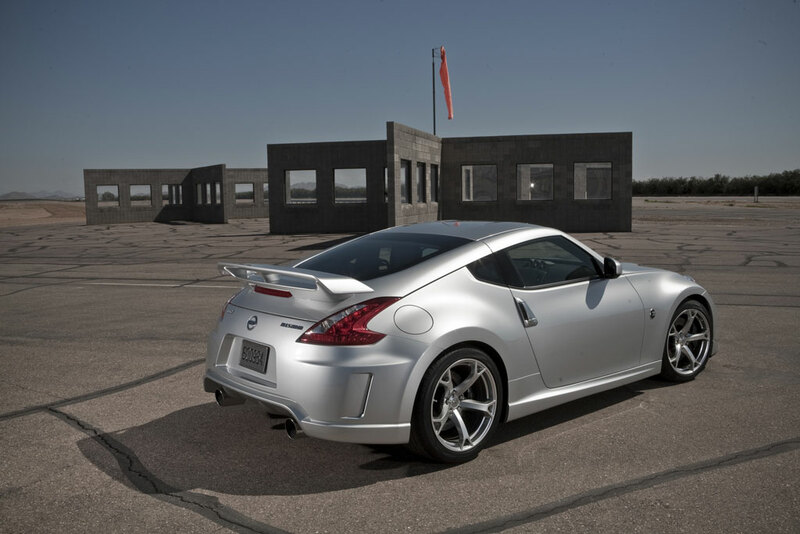 The NISMO 370Z has an overall length of 174.3 inches. Special side sills and a unique rear bumper help control airflow under the vehicle, while the functional rear spoiler increases downforce. The NISMO 370Z exterior also includes a wide stance, sculptural fenders, upswept quarter windows, bold “boomerang” shaped headlights and taillights, vertical door handles and aluminum hood, door panels and hatchback. The headlights are a High Intensity Discharge (HID) bi-functional xenon design with an auto on/off feature. The NISMO 370Z’s driver-centric interior includes NISMO logo seats with black and red fabric and red stitching, a NISMO tachometer, steering wheel with smooth leather and red parallel stitching, smooth leather-wrapped shift knob and aluminum trimmed pedals. A special serialized plaque of authenticity, located on the vertical panel above the floor-mounted console, is matched to each NISMO Z®, identifying its unique serial and model year designation. The NISMO 370Z’s 2-seat interior layout is built around a deeply scooped instrument panel with a full-length center console separating the driver and passenger’s seat. In the rear is an open cargo area with enhanced storage and accessibility. The instrument panel includes a 3-pod cluster with oil temperature, voltmeter and clock, while the speedometer and tachometer include an “initial sweep” function, coming alive when the NISMO Z® is first started. Both the driver and passenger’s seats are structured with an anti-slip material in the main seating surface. The sporty woven cloth seats feature standard 8-way driver’s/4-way passenger manual adjustments. Adjustable front seat Active Head Restraints are standard. Standard interior comfort and convenience features include Nissan Intelligent Key™ with Push Button Start, power windows with one-touch auto up/down feature, power door locks with auto-lock feature, a center console box with a new non-intrusive cover design, automatic climate control, rear window defroster with timer, two 12-volt power outlets, four cupholders (two in door panels, two in center console), dual overhead map lights and a AM/FM/CD/AUX 4-speaker audio system with illuminated steering wheel-mounted controls. 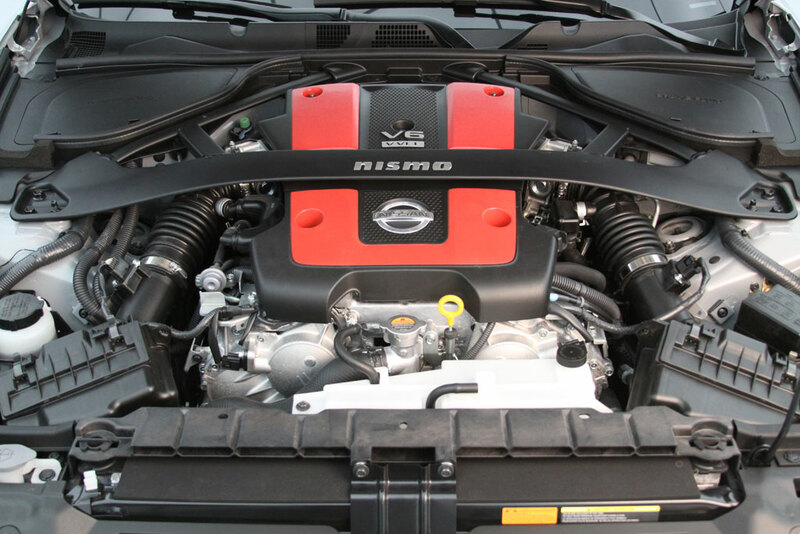 The NISMO Z’s long list of standard safety and security features includes the Nissan Advanced Air Bag System (AABS) with dual-stage supplemental front air bags with seat belt and occupant classification sensors; front seat-mounted side impact supplemental air bags; roof-mounted side-impact air bags; seat belts with pretensioners and load limiters, Active Head Restraints, Zone Body Construction with front and rear crumple zones, Nissan Vehicle Immobilizer System, Vehicle Security System and Tire Pressure Monitoring System (TPMS).